You bring not only the sense, but also the experience of adventure to every space you enter. People come to know you as a force for the unpredictable and the spontaneous, building up stories about that time they spent with you when they woke up one morning on a fishing boat in Nova Scotia. 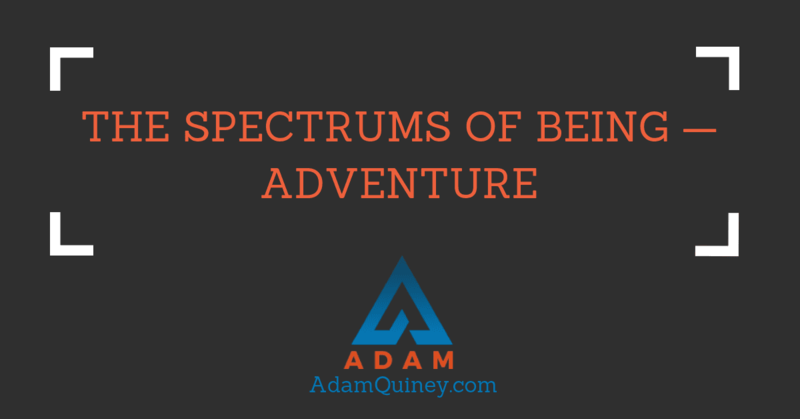 Your innate love for adventure leads you to many different walks of life, and you are able to thrive in almost any environment (with the exception of the one that is unchanging and mundane). What is predictable is that your adventure becomes a risk that you have to manage. As time wears on and the stakes of life become greater (better jobs, more money, raising a family, etc.) your pull towards adventure becomes an undesirable habit that you feel compelled to lock down, leaving yourself experiencing life like a caged animal. You swing between experiences of being locked up and bored, but safe, and reckless, wild abandon, followed by intense regret and recommitting to locking the cage even tighter. You are the possibility of never-ending adventure. Your gift during your time on this mortal coil is to show the world that life isn’t as risky as our biology would leave us to believe, and to help all of us see that we are so much more adaptive than we are willing to trust. As you do your own work to own and fully-express, with responsibility, the adventure that you are, you teach the rest of us to let go of some of the control and restrictions we’ve placed around our life. You are here to teach us how to be free, starting with yourself. Your natural love and thriving in adventure makes you difficult to contain, which is frustrating for your parents, care-takers, and teachers. You often have the experience of being told that you are disobedient and struggle with the high amount of control that is consequently placed upon you. Ownership of your adventure can put you in unpredictable and, at times, dangerous situations. While you can thrive in these situations, you can also lean out to far and put yourself into hotspots, requiring other people to rescue you, and getting you labelled as a high-risk to be around. Tired and exasperated with the control that the world seeks to impose upon you, you don’t just throw caution to the wind, you drop-kick it into outer space. Your relationship to any kind of control or structure is like an allergic reaction. You constantly and continually take ever-increasing risks, putting yourself and those around you in danger wantonly. The control that the world around you sought to impose to keep you safe becomes internalized. You continually and constantly close off avenues for the expression of the adventure that you are, leading a small, contained and controlled life. Having learned that your innate way of being is dangerous and needs to be controlled, you are bored, boring, safe and predictable.